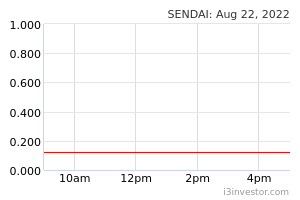 SENDAI fell 4.5 sen (-7.50%) yesterday to close at RM0.555 on higher-than-average trading volume. Chart-wise, the share formed a long bearish candlestick which decisively broke below its 20-day SMA after a failed test of its 50-day SMA, which indicates the possibility of a downtrend continuation. Coupled with lacklustre signals from key momentum indicators, we believe the share could potentially head lower. Should selling pressure continue, we believe that RM0.530 (S1) and RM0.455 (S2) should offer some supports. Conversely, any upside should see resistances at RM0.575 (R1) and RM0.660 (R2). 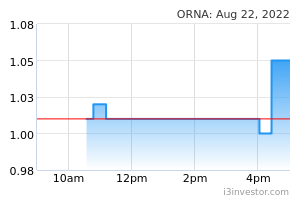 ORNA increased by 3.0 sen (+2.91%) to close at RM1.06 yesterday. Technically, yesterday’s bullish candlestick could suggest a trend reversal. Momentum indicators appear encouraging as displayed by the MACD bullish crossover and minor upticks seen in RSI and Stochastic. From here, follow-through buying may bring the share to meet resistance at RM1.10 (R1) with a decisive take down will see the index on a higher note at RM1.20 (R2). However, failure to do so, the share may retreat back to immediate support level RM1.00 (S1) and RM0.880 (S2) further down.